I have a confession. I’m a digital clutter hoarder. I never used to have problems with digital clutter so I’m not exactly sure how this has happened but suddenly, my PC hard drive is nearly full and my email inbox is bursting at the seams. So, I’m staging my own personal intervention. Time to get this situation under control. Stat! Looking back over the digital clutter on my hard drive, it seems a lot of the files are ones I was keeping, just in case. Files like copies of invoices, downloads of this, that and the other thing, lots of freebie eBooks. Most of which probably served their purpose immediately and could easily have been deleted then and there. Why they’re still hanging around is anyone’s guess… I certainly don’t have a clue. And don’t get me started on the emails! During this self initiated intervention, I managed to clear over 1700 emails from my inbox and free up over 60GB of space on my hard drive. I have no doubt virus scans are going to be a lot quicker from now on! Here are the four basic steps I took to wrestle back control of my hard drive and email inbox. You might find them helpful for dealing with your own digital clutter, too. 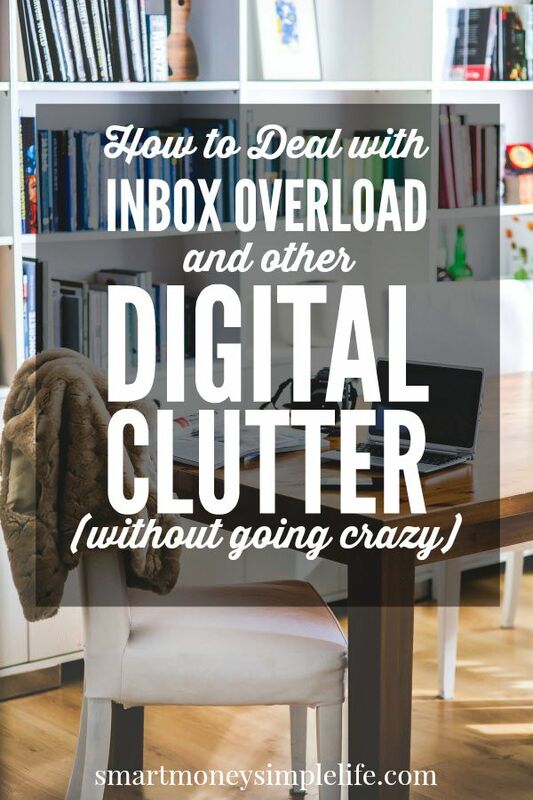 If you’ve got a problem with digital clutter, commit to solving it in one fell swoop. If you work on it a bit at a time, you’ll find you’re just maintaining the status quo, not making a lasting change. Sure, the situation wont necessarily be getting any worse but it definitely wont be solved with this approach. So, dedicate an hour of your time and commit to resolving the problem. When tackling my email inbox I changed the order of display from ‘Received’ to ‘From’ that way, all the emails were collated by sender. You’re pretty much guaranteed to be able to highlight huge slabs of emails and hit delete when they’re listed by sender. If you’re like me you have untold numbers of emails that are just advertising. You don’t need to keep these. If you’re serious about being frugal and saving money, do yourself a big favour and unsubscribe from these mailing lists. Trust me, you wont miss them. Whether it’s a word or excel file or an email you want to keep, it needs a permanent home. Create a filing system that makes sense and use it, but only for those files or emails you have a very good reason to keep. Everything else should be filed under ‘Recycle Bin’. Yep. Embarrassing but true. 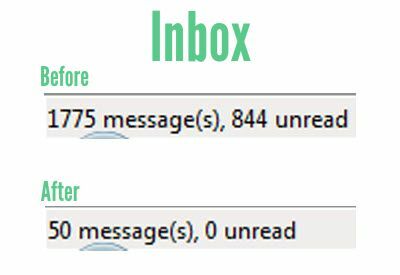 My Inbox included 844 UNREAD messages. Now that’s digital clutter! As above, if there’s not a compelling reason for keeping a file or email, delete it. Compelling reasons are probably few and far between. The most common one will be tax related. If you’re not sure you need to keep something but don’t want to delete, create a ‘Limbo’ file and move it there. There should be very few instances where a file will need to be placed in ‘Limbo’ so don’t be tempted to swap it for the recycle bin. You’ll also need to be ruthless with your email subscriptions. We all have emails that pop up regularly; blogs, retailers and sites like Groupon. Take a moment or two to think about whether the information provided still serves you. If it doesn’t, unsubscribe. I’ve also started unsubscribing to any sites that email me more than once a day without a very good reason. What about the not going crazy bit? The trick to not going crazy while you’re dealing with all that digital clutter is not to think too deeply about the files and emails you’re deleting. True, you will need to give careful consideration to some items before you hit the delete button but, by far, the vast majority should be a straightforward process of select and delete. If you keep this in mind while you sort through your digital clutter, you’ll find you’ve arrived at zero unread (if not zero inbox) without feeling the need to tear your hair out even once. How’s your email inbox looking? What about your hard drive? Maybe it’s time to deal with your digital clutter, too? I go insane when my inbox has anything in it that needs to be dealt with. It’s almost a problem for me though because I am then always checking my email! Used to have hundreds of unread emails (stuff I didn’t bother delete, even if not important). Now I am keeping my inbox ‘slimmer’, even if I do have to de-clutter every once in a while. Yes… you need to be vigilant when it comes to deleting old and unnecessary emails. It’s amazing how quickly they add up! My email inbox is giving me some troubles. Inbox overload can really sneak up on you. I highly recommend unsubscribing to everything but the most important correspondence.